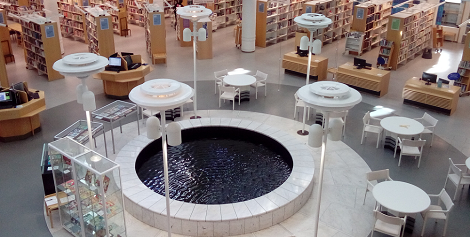 During our trip to Helsinki, the library team was given an interesting tour of the Pasila Library, with some 3 500 m2 of public space and its splendid water feature. The library was designed by architect Kaarlo Leppänen, and construction work was completed in 1986. Networking, architecture, good collections (both physical and digital), highly educated professionals and popularity; these are the characteristics of Finnish libraries. Public, academic and special libraries are well visited and used. When we arrived for our meeting at 9.00 (opening time), there was already a queue outside! The library network in Helsinki has been growing for over 150 years, meeting the needs of its customers. The library follows the latest developments and offers services enabling the inhabitants of the city to be active citizens in society. We were very impressed with the whole library. Pasila Library has more than 200 000 items, including material in over 100 languages, which can be sent to other communities all over Finland. Pasila Library does a particularly good job of supporting immigrants who are learning Finnish and providing them with information about local culture. It also has a children’s section with an excellent selection of books in English and many other languages. Many older Finnish children read in English and there is plenty for them to enjoy here. The library thus takes an active role in inviting young children to become library users, creating brochures, invitations and games that encourage them to visit. The Library Act states that public libraries should play an important role in informing citizens and in the life of the community. In Finland there is a modern public library in every municipality. The number of loans and active users is arguably among the highest in the world. 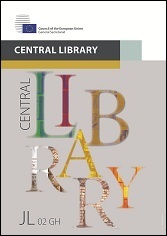 Libraries are considered to provide a fundamental local municipal service, which guarantees libraries’ continued existence even in an economic crisis. Additionally, the role of library professionals establishing and developing libraries has always been considered important in Finland. Innovative staff is a precondition for dealing with change. Many thanks to the enthusiastic librarians for showing us around and for sharing their experience and knowledge with us!